Art school adventures continued! As any long-time reader knows, I am currently attending a university that offers an in-depth art department. 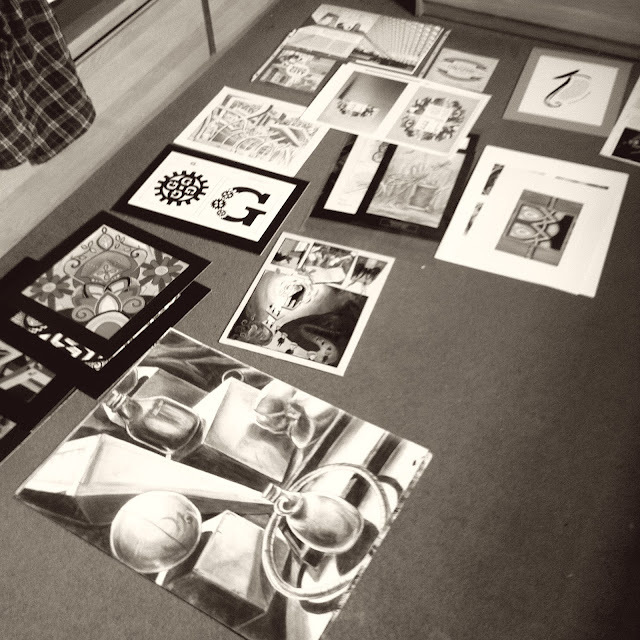 I've already shared some of my artwork from Freshman classes: 2D Design, Drawing I, and Drawing II. Freshman year I also took Metalwork and 3D design. Now that I've completed my sophomore level studies, I'm taking a look back at my progress throughout sophomore year. I am shooting for a double major in Graphic Design and Illustration, with a minor in Art History. 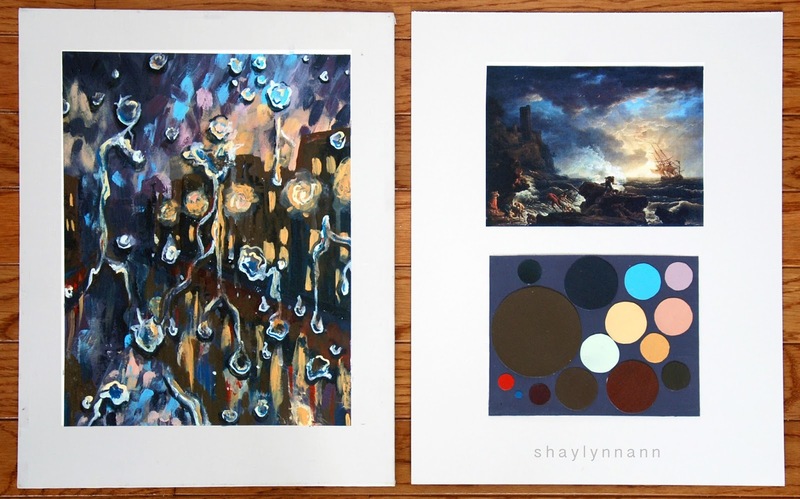 This spring, I completed portfolio reviews and was formally accepted into the Dual major program! This spring also marks the end of my Foundation studies; starting next fall, I get to take specialized classes in graphic design and illustration. 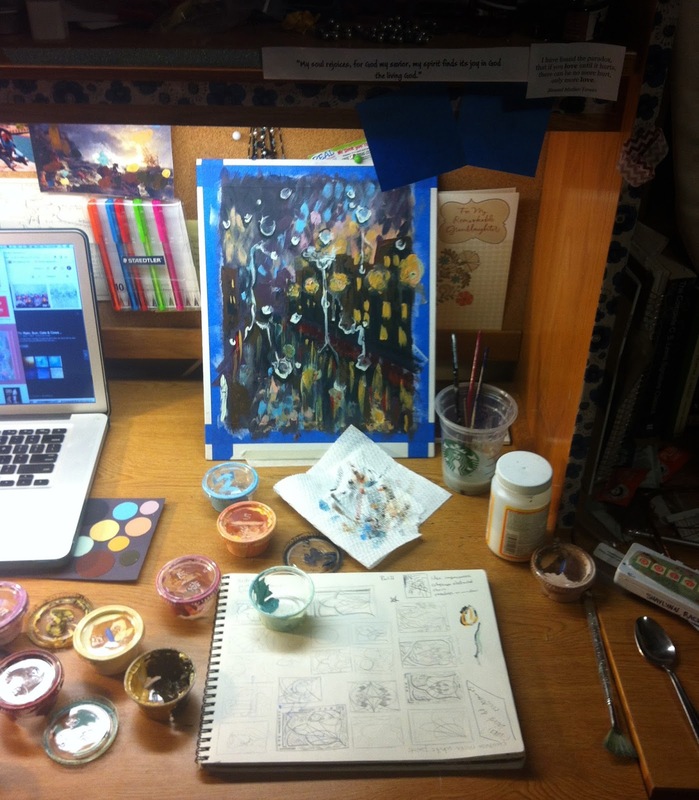 This is what the dorm room looked like while I was putting together my application portfolio. Back in the fall I took three art classes, and three ge-eds (Calculus-- which I actually enjoyed--, a really awesome literature class, and Anthropology). My favorite class of sophomore autumn was, by far, Intermediate Design (otherwise known as Color Theory). A very sweet, knowledgeable Polish artist taught the class. 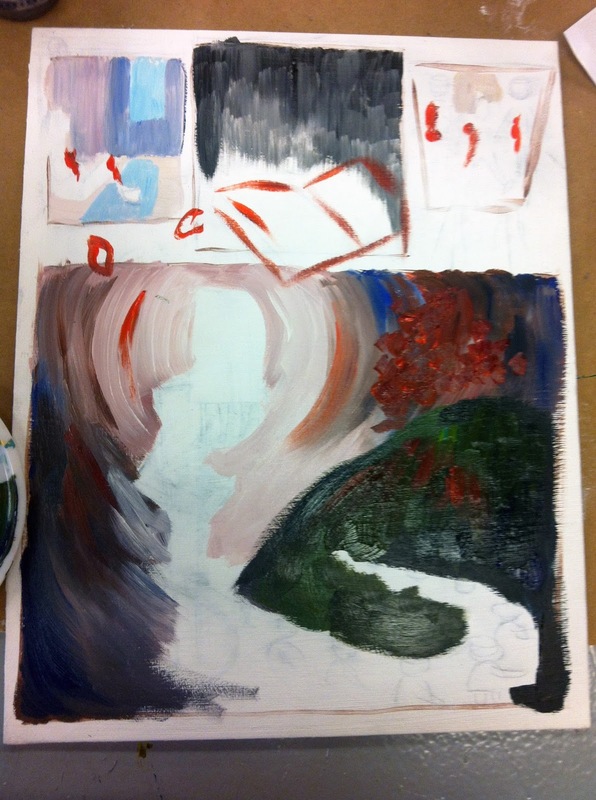 She challenged us all with complicated assignments and in-depth critiques, and I have to say that both my painting skills and my eye for design improved dramatically last autumn. But let's just say, I had no idea how much could be involved in the study of color. Sure, back in eighth grade I was so confused by how color worked that I read the Wikipedia article on color, studied the way that color frequencies are absorbed and refracted, made my mom buy me two prisms, got thoroughly confused about color spaces and gamuts, and proudly knew how the eye detects color and sends the signals through ganglion cells. Normal people totally do that, right? (ha). But, aside from a "gut reaction" to what colors go well together, I had no objective understanding of how subjective color can be. Of the ways that they affect one another and regularly trick your brain with a myriad optical illusions. Of how to pay attention to hue, value, and more to made educated choices in your artwork. 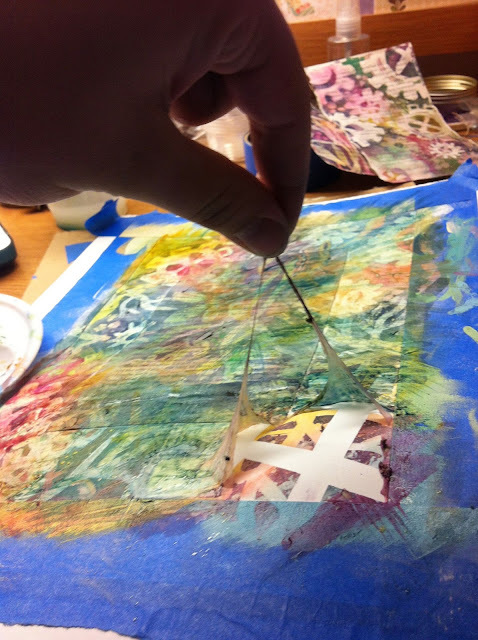 We didn't have any assigned textbook readings for this class, but hands-on experimentation is, I think, pretty much the best way to learn about color theory. 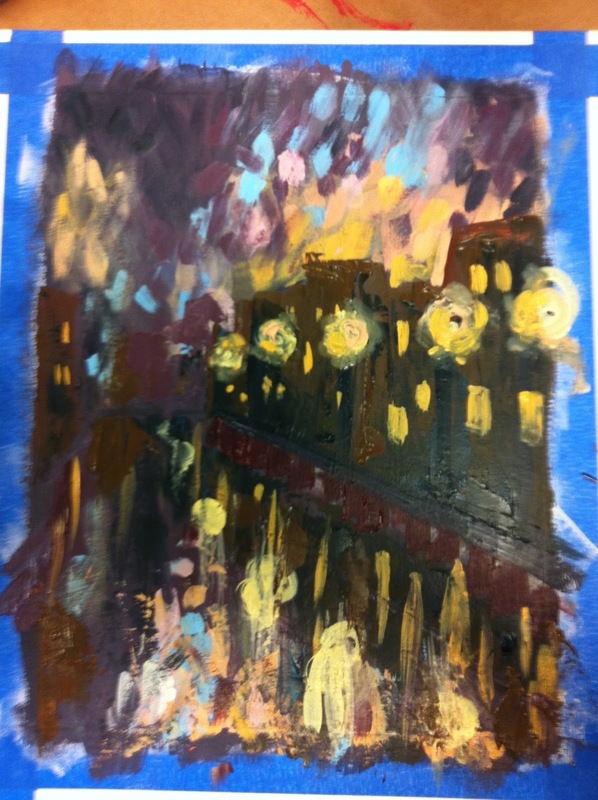 Turns out that hands-on experimentation means the most homework I had ever dealt with in an art class. 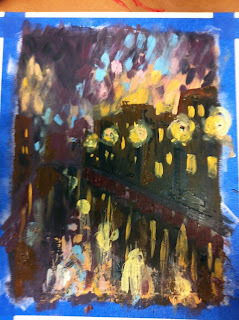 The first project focused on learning about value and how to see the value of colors when the hue would normall overwhelm. We first came up with designs-- mine was inspired by Fluer de Lis. Then, each "set" was painted with acrylics. The full fluer-de-lis design was done in high contrast, and the dismantled one in low contrast. Each shape had to have it's own value. 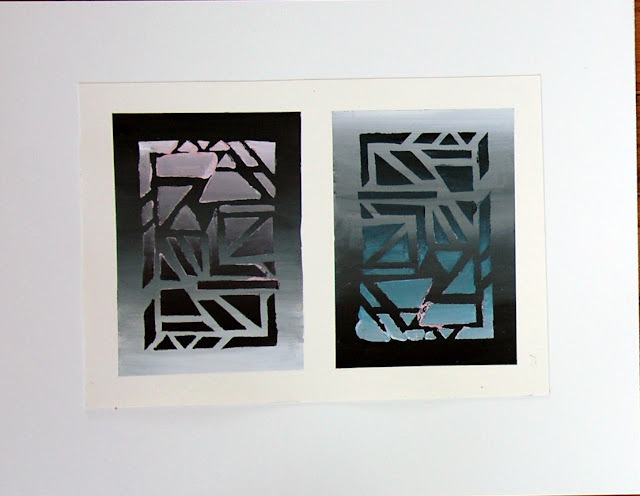 The top set on the left page was done in nonchromatic gray (black + white) and the bottom set was done in chromatic gray (black + white + just enough color to give a gentle tone). The right page features full color (only fully pigmented paints of analgous colors were allowed to be mixed) and muted color (a color + white or black to made a tint or shade, or a color + a color from across the pond on the color wheel). The values of each square needed to match, regardless of the type of colors used to piece this puzzle together. 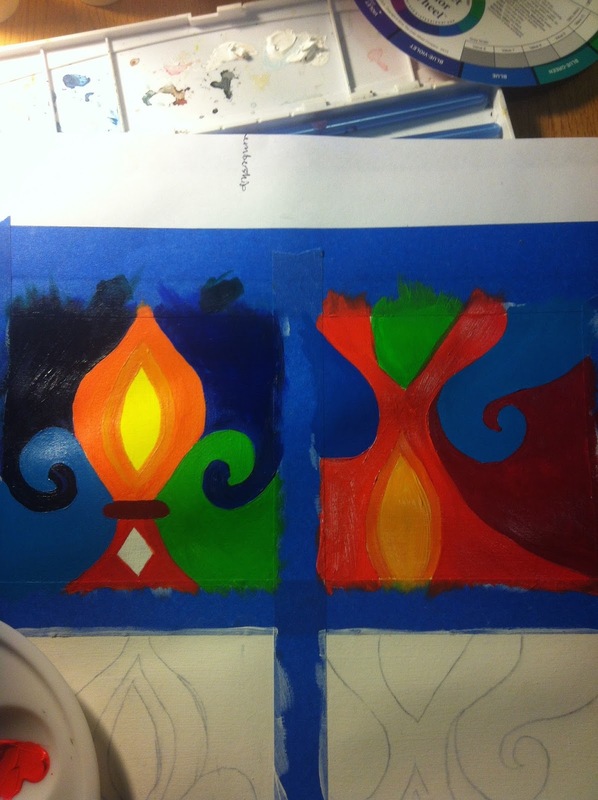 Let's just say that the first time I attempted the color part I completely misunderstood the assignment sheet. We were also assigned two "free studies" to go along with each project. These were my first two! Implied transparencies were the next task; painting each of these shapes overlaps and the colors mixed via that overlap were very difficult for me, technically. 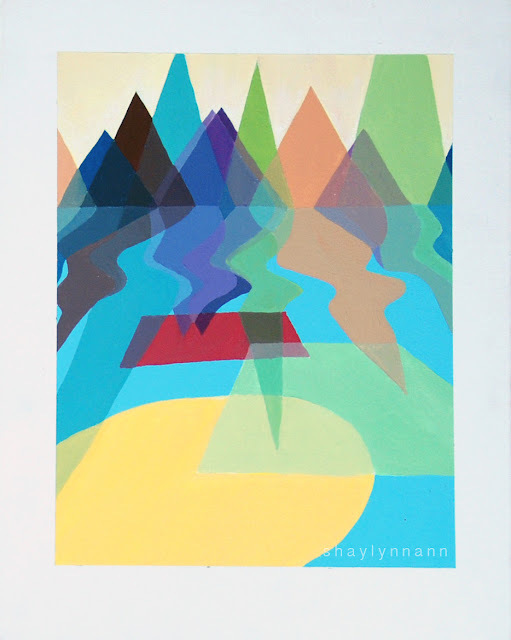 I made the abstract mountain in Illustrator during one of my graphic design classes' deadtimes in class, and added the circle and rectangles by hand afterward when I was copying the design onto canvas. I still am not sure how I feel about this color scheme... not the biggest fan of pastels. But I do think that, personal prejudice aside, they are at least cohesive and balanced. 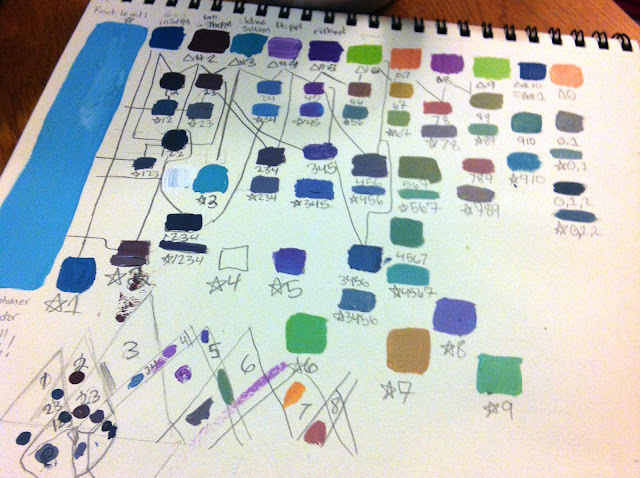 I made a color map as I mixed colors; all told, this piece had some 82 individually mixed colors! My favorite part of this project, though, was the free study homework. We had an old copy of The Hobbit, dropped into the bathtub by my brother, that I saved to use for art projects. It's been put to good use in some of my sketchbooks before, and here I just doodled all over two pages. This is my favorite bit, though. I'd heard of masking fluid before and wanted to mess around with it; this was when I finally had an excuse to purchase yet another overpriced art supply. This is why artists are stereotypically broke. It's not that we can't make good money; we just spend it all on cool new toys! Peeling it off is oddly satisfying. 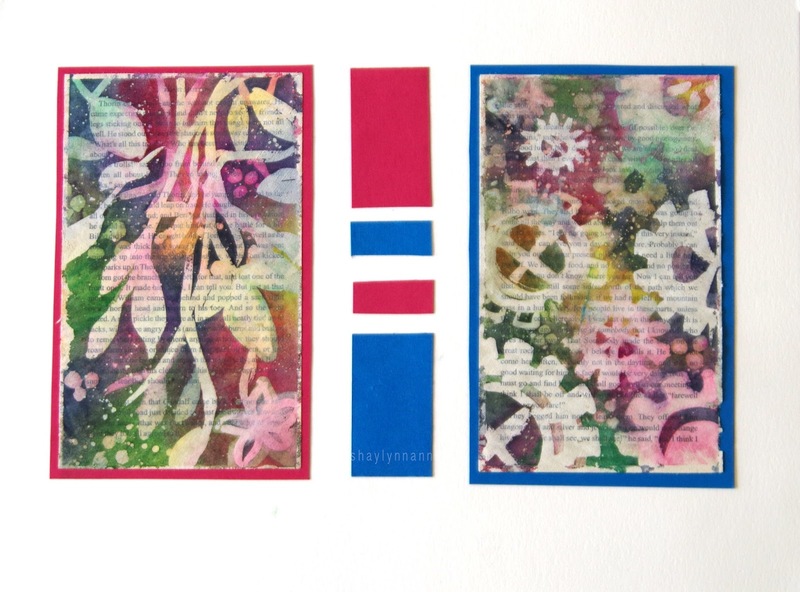 To make these pieces, I first painted the white gears and flowers with masking fluid. Once it dried, I applied a thin layer of dappled watercolors. More masking fluid; another layer of darker and more saturated colors; and repeat. Just look at this awesome magical multicolored effect. IT'S SO COOL. This is the larger piece I made; I'm not so fond of the pure white everywhere. I should have done a nice gentle wash before using the masking fluid. 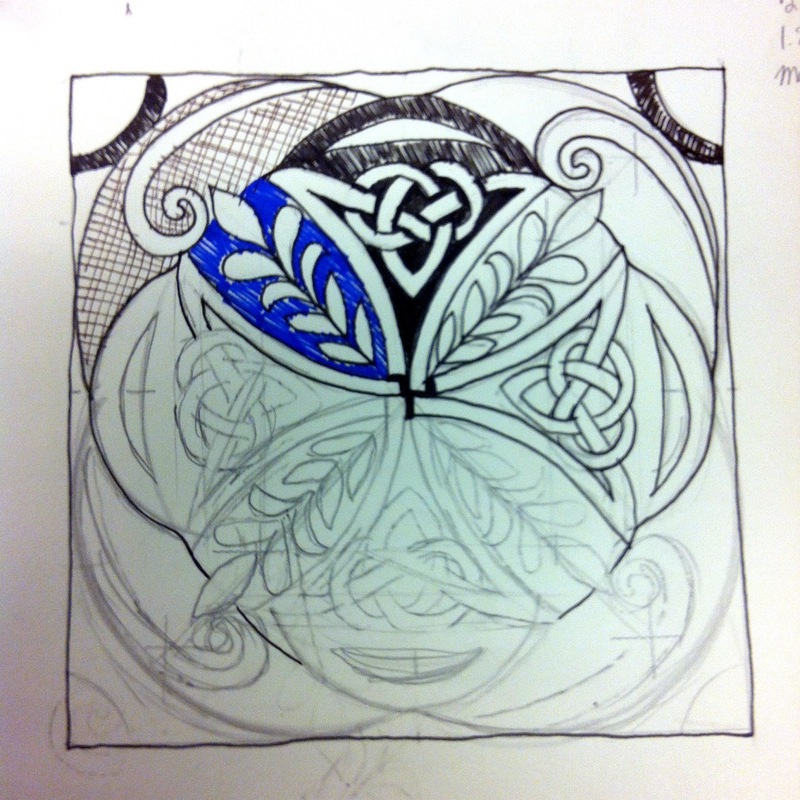 Yay celtic knotwork, I always have to use celtic knotwork in my artwork! This is a shattered knot that is a study of gradation. ...and more free studies. I was totally that art student who went around campus grabbing leaves to paint. 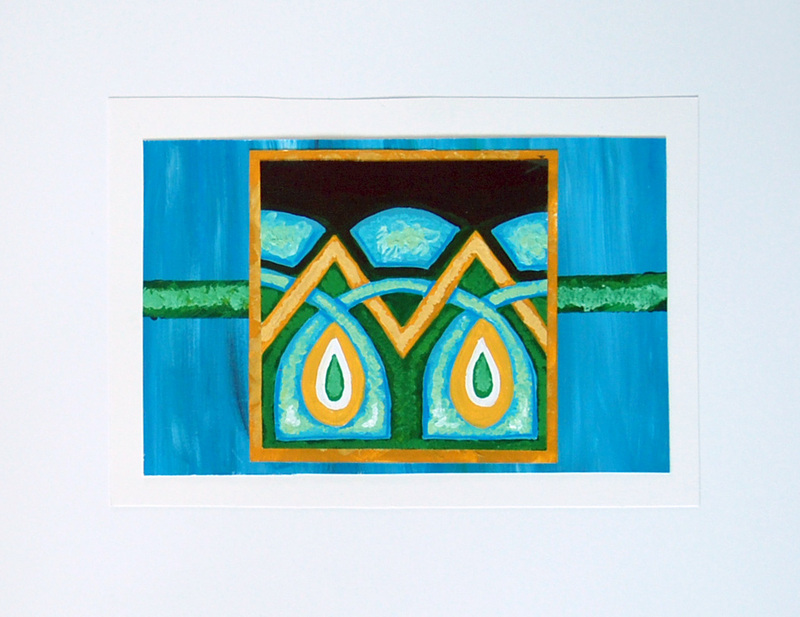 Certain colors, when placed near each other, seem to affect each other in strange ways. The Bezold Effect deals with the way that a color can look lighter or darker (or, more or less saturated) than it really is, depending on what sort of ground it has. The placement of color can also alter the dominance of a design. Again, we were not allowed to do "representational artwork." This project would center around a pattern, either copied from or inspired by historical patterns. I chose to draw my design by hand (knotwork and such is actually faster for me by hand than on the computer). It's inspired by components of patterns from: Celtic knotwork, Korean dancheong, traditional Maori tattoos, and Norwegian rosemaling. 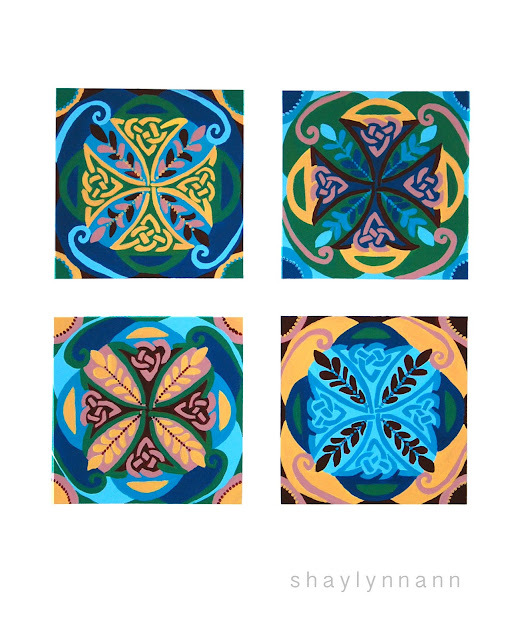 Each of the squares is the same design, and the same seven colors are used on each. No color was allowed to be in the same spot in any other square. I scanned in my original sketch to do sample colors on Photoshop. It's really interesting how the patterns look different just because of where the colors were placed! I also LOVED basically every piece my classmates did for this project, too. There were some really clever and aesthetic ones. Oooookay. You want to talk technically challenging? This project was just about the end of me. Pick two pieces of art you admire; one with flat colors, and one with mixed colors. Mix exact copies of the colors in the artwork. Cut those shapes so that the amount of said color is in exact proportion to the amount of said color in the original artwork. By eyeballing it. Come up with designs inspired by the "feel" of the original artwork. 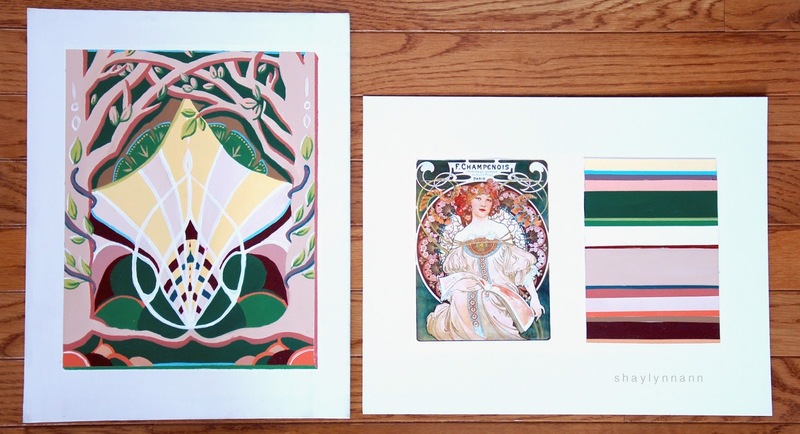 Color that design using the exact proportions of color that were in the original artwork. This design was supposed to be a dramatic cityscape seen through a window with water droplets running down the glass... but apparently a couple of people thought I was painting abstract people?! This is one of those projects that I dreaded while I was working on it, but which I love now because I learned so much and developed neat pieces. This painting is my favorite piece of the semester, which is hilarious because stylistically it is very different from my typical artwork. We were each randomly assigned a small cutout from a magazine, and had to incorporate it into a painting. The technical challenge for this was to try to paint it so well that the illustration is hard to spot. It was our finals project, and we were given almost free reign. I have to say, it was a relief to be able to make a representational, illustrative painting! My illustration was this funky guy opening his head and dumping words into something (a trash receptacle?). After just a couple minutes of brainstorming, I knew that I wanted to use this project to address the idea of groupthink. In high school, I studied 1984 by George Orwell and, in the midst of writing several essays on it, realized just how important and scary the book is. Compound this with the fact that every other book or movie these days is dystopian, and that I had recently been in a conversation about how real censorship (and mob censorship) is even in a country of free speech-- really there was nothing for it but to illustrate groupthink. But how to tell a complex story like that on a single canvas? I didn't simply want to show a guy emptying his thoughts... hence the comic strip sections. Since this was to be a cohesive single piece of art, my focus when planning the painting was on making the comic panels interact with each other. I also tried to use color and dominence so that (ideally) the viewer first "reads" the panels left to right top to bottom, then circles the painting clockwise, then hones in on first the man dumping out his thoughts, then the line of drones, then the book. Also, in the background is "The pen is mightier than the sword" and some really poorly painted fire. I didn't have reference photos when I was in class that day, painting. Stylistically I tried to pull in some Tim Burton and Dr. Suess (and, weirdly, a screencap of a background from Mulan). The struggle was real. The other project in the class was a ten minute long presentation. My topic was synesthesia-- and I was so grateful I was able to get that topic, because it is a subject near to my heart! I'd done a great deal of research on this in the past couple years since I found out it was a thing. Hopefully my speech did a good job of presenting the science and coolness of synesthesia without making people think "LSD!" or "Superpowers!" I had intended to record a practice run for the YouTube channel and forgot; I might yet do that someday. This large art dump represents an entire semester of work (minus the messy paint and the twenty-odd sketchbooks pages filled with some twenty thumbnails each and minus the overflowing Pinterest "research page"...).